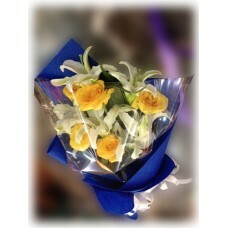 Bouquet of 5 yellow roses and 2 white lilies wrapped in blue is prepared for a man. Great selection for your male business associate, a friend or a person you would like to express your appreciation. Yellow roses represents feelings of joy and delight. White lily in this bouquet means health, provision and growth and development. A card with your own messages is attached. To another year of incredible feats!